Granola Minis Apple and Cinnamon contain pure rolled oats, sweet apples and spicy cinnamon. 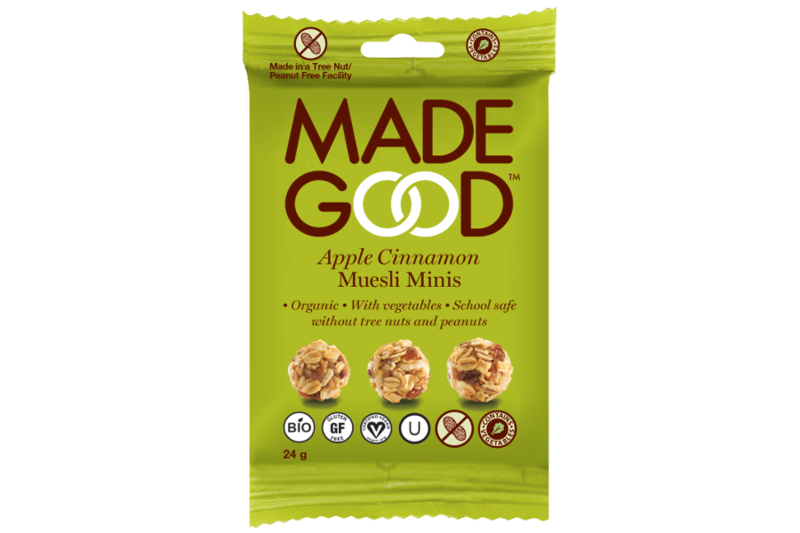 These wholesome muesli minis taste just like home made apple pie. They’ll leave you feeling full and happy on the inside. Feel good about choosing Apple Cinnamon. Whole grains are an essential part of a healthy diet. These bars contain oat bran, believed to lower LDL, “bad cholesterol”. They’re also slow to digest, keeping you fuller longer. All ingredients are ethically sourced. Pure rolled oats* (38%), apples* (9.5%), raisins*, cane sugar*, agave nectar*, sunflower oil*, whole grain crisp brown rice*, agave inulin*, tapioca flour*, cinnamon* (1%), vegetable powder (spinach, broccoli, carrots, tomatoes, beets) (0.4%), shiitake mushroom powder.